This event was generously supported by L’Ambassade du France. 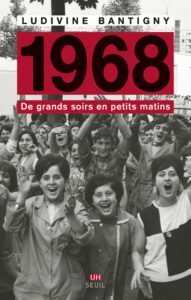 This fascinating paper surveyed recent approaches to 1968, summarising and situating Ludivine Bantigny’s recent book 1968: Grands soirs et petits matins (Seuil, 2018). The strikes, protests, and movements of 1968 have in part been reduced to a type of party in popular historical memory. Yet, Bantigny was keen to stress the importance of the General Strike at the heart of the movement, and to take the study of the events beyond the feted month of May, back to the Caen strikes in January 1968, and even back to February 1967 with the strike at the Rhodiaceta plant in Besançon. Likewise, she wanted to look at the agency of under-studied figures, such as the role of women during the General Strike (like the occupation of the Fermeture Éclair plant in Seine-Maritime), or the way in which acknowledging the agency of the forces of order revealed fissures between the CRS, police, and so on. Banitgny explored the international and internationalist character of 1968, unpacking the echoes and interactions, travel and circulations between settings and situations of protests and strikes. From alliances on the left, where protest movements interacted with trade unions to propose broad projects for change, to similar alliances on the right, such as those who mobilised with prefects and officials to prevent the return of Cohn-Bendit to France, or to throw their support behind De Gaulle (including the OAS). So too was 1968 a sensory experience, in which a sense of ‘suspended time’ arose from the occupation of spaces and places which interrupted the normal flow of history. In these moments, revolutionary and utopian projects bloomed in the cracks that formed between the walls of everyday life. In this context, Sartre’s interview of Cohn-Bendit could seem to represent some realignment, in which the extension of the field of possibilities presaged a broader revolutionary breakthrough. Her paper ended with a commentary on the legacy of 1968, which former President Sarkozy had attempted to erase, and which President Macron had recently attempted to historicise (and neutralise) through commemoration. Recent protests had taken up this battle, defiantly spraying on walls the slogan: “1968: ils commémorent, on recommence”. This tussle could be seen more broadly in Daniel Cohn-Bendit’s personal trajectory, from oppositional rebel to close ties to the President. This problematic symbol of 1968 promoted the notion of the May Events as a ‘student party’, while playing down their deeper legacies in his call to ‘Forget May ’68!’. While acknowledging that his notional defection could not be made indicative of a whole generation, Bantigny questioned how we read Cohn-Bendit’s micro-narrative in a broader context; did it represent a recuperation, realpolitik, or something more like selling out?